Tommy major problem more than the Hypotonia, it is the lack of motivation and/or maybe self-confidence to get around by himself. Back in September, Tommy's motor skills improved in an unbelievable way. Our PT decided to do something unusual, after we tried everything, taking him out of the therapy for a little while. We did and we were astonished of the amazing progress he did. He accomplished in 7 weeks what he didn’t in 7 month. He suddenly went from sitting up on his own while he lays down on his back to creeping and suddenly he switched to army crawling; from occasionally creeping to pull up; from pulling up to occasionally climbing in and out the couch; from climbing to tall crawling; from standing up without support for a few seconds to cruising. This is the reason we think his muscle are not the major problem. It is his lack of motivation to get around, which makes things harder. We have to experiment with everything possible to get him motivated without knowing what will truly work for him. He is getting so close to walk, but his lack of motivation is hitting him back again. One of his PT suggested a walking bike, the "Cheeky Chick" by Okiedog. Tommy rode the Cheeky Chick bike during one of his PT visits. He walked with a little support while he was riding the bike. Therefore, we got it for him, but he didn't want to ride on his bike the first weeks. He gave it a try on Monday by his own choice and it seems he enjoyed it. He rode it with little support, it is good sign! Before the bike, we got a shopping chart by Melissa & Dog in October. He pushed the shopping chart in short distances several times by himself, but he doesn’t want to do it any more. I will incorporate the shopping chart into his play time very slowly during the coming weeks. Tommy started to walk with support since he was around 12 month, but know he is also giving us hard time because he doesn't want to be held. Well, I got what motives him, singing or counting his steps. We don't hold him by his arms anymore, we hold him by his torso because he gets control of his walking pattern. 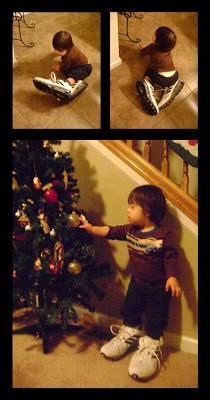 His PT suggested to put him to walk with daddy's shoes to help him to put more weight in his feet while he walks. Watching Tommy to walk with support while he was wearing daddy's shoes was very funny this evening. He is progressing very good every week during his Aqua therapy sessions. He stood up by himself in the water for about 10 minutes on Monday. His PT shook the platform several times while he was standing and he didn't fall, which means his balance is good, but he doesn't have the same confidence when he is out of the water. The goal of the Aqua therapy is to give the child the gross motor skills and confidence in the water because it is easier. Then, they will be able to transfer the skills into their normal routines. It seems, it is working for Tommy. He came to me and held my cloth to pull up on Monday evening; and then, he let his hands free and was standing by himself for a while and he did over and over again. It was a fun game for him. Now, he is doing it in the crib all the time. Tommy's two Physical Therapists are doing everything they can to help him to walk. I know he will, but it will be on his own terms as everything he does. We will keep helping him to strengh his muscle and motivating him to walk, and one day, I will send a post about Tommy's first independent steps. He's so close, that Tommy will be walking before you know it! Motivation is key for sure! 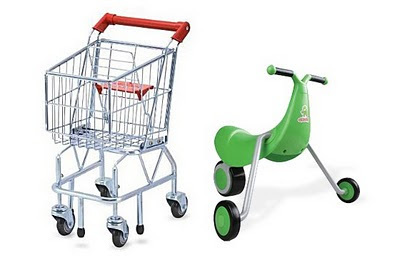 We are going to buy one for Gabriel (bigger sized for bigger kids, of course) because he still needs to work on balance. We're hoping that his Saturdays at gymnastics will definitely help, too. i agree with lianna, he is going to be walking before you know it:) keep up the great work little man:) super cute pictures too.